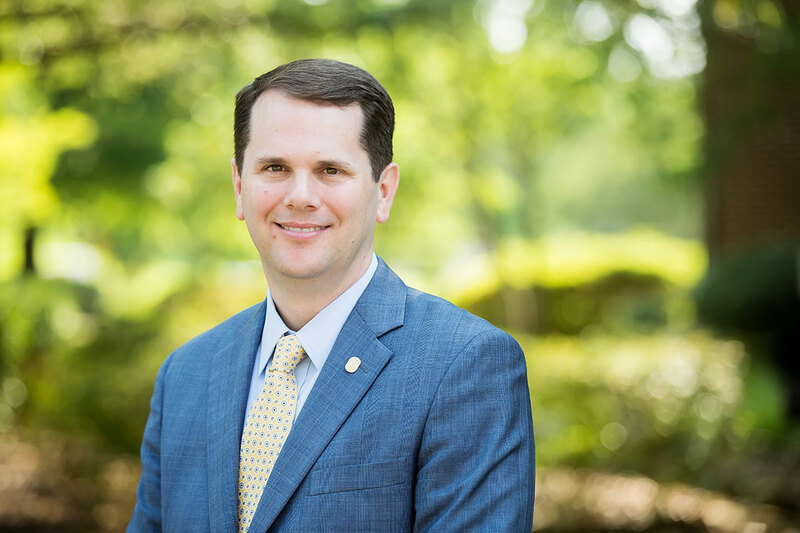 Mississippi College leaders will join inauguration ceremonies to install Blake Thompson as the 20th president of Mississippi’s largest private university. Members of the MC family will join with state and national leaders for a week of special events culminating in an inaugural ceremony on the historic Quad on Friday, March 29 at 4 p.m.
Activities begin Sunday, March 24 and over the course of the week, MC’s commitment to academic excellence and the cause of Christ will be on full display. The week begins with a community-wide worship service, features a scholarly academic symposium, engages the city through service projects, and includes a concert on Olde Towne Clinton’s red brick streets. Inaugural ceremonies rarely happen at MC. With its charter established in 1826, Mississippi College is America’s 2nd oldest Baptist college and the state of Mississippi’s oldest institution of higher learning. Dr. Lee Royce was the last MC president inaugurated more than 16 years ago. Inauguration activities will see higher education leaders join university supporters for a celebration that’s both meaningful and memorable in the life of the institution. “Inauguration offers an important time for us to pause for a moment and reflect on the institution’s rich history. It also offers us a chance to dream about MC’s bright future,” President Blake Thompson said. Dr. Thompson hit the ground running as a student-oriented leader since arriving July 1, 2018. He and his wife, Jana, along with their three children have been warmly received on campus and in Clinton. “The authenticity and consistency that Dr. Thompson brings to the table is something that fellow administrators, faculty and staff, the student body, and the community of Clinton strive to exercise within ourselves,” said Student Government Association President Anthony Jackson. “He’s open, honest and always puts his students first,” added the Mound Bayou resident. The Thompson family has enjoyed their homecoming, but they are happy to see the series of inaugural events spotlight MC’s stakeholders. MC students and faculty will host the many ceremonies which will showcase the university’s role in metro Jackson, the state and around the globe. “I am animated by this MC family, especially the remarkable students on our campus. I am pleased that so many Mississippi College supporters, our friends from across higher education, and many who will be visiting Mississippi for the first time will have the opportunity to find what makes MC such a special place,” Thompson said. Early in the Thompson administration, enrollment rose to 5,138 students for Fall 2018. There are several major academic initiatives in the works to strengthen university programs for years to come. The inauguration will point to what’s next for MC as it approaches its 200th anniversary. The week begins with a community-wide worship service 6 p.m. Sunday, March 24 at First Baptist Church Clinton. Members of the MC community are invited to a service at Provine Chapel on Tuesday, March 26. It begins at 10:50 a.m. and features an address by President Thompson. Community service projects are set for MC’s hometown in the City of Clinton and in Jackson. Projects touch on topics such as church planting, food insecurity, as well as adoption and foster care. Other notable public events include the March 29 dedication of the beautiful sculpture “Christ in Gethsemane” crafted by internationally celebrated artist Sam Gore of Clinton. The Friday event is set for 10 a.m. at the Rhoda Royce Prayer Garden. The 4 p.m. Friday inauguration ceremony in the Quad is followed by a community reception at the Piazza and Jennings Courtyard. Both events are open to the public. A native of Rienzi, Mississippi in Alcorn County, Thompson received three degrees including his doctorate from the University of Mississippi School of Pharmacy. He holds an executive master’s degree from the Georgetown University School of Business. Following a national search, the Board of Trustees selected Dr. Thompson for the university’s top post after his nine years as a vice president at The Ohio State University. He previously worked for Battelle, the world’s leading nonprofit R&D organization. He has also served in Washington as a senior staffer to the U.S. Senate Appropriations Committee and to recently retired Senator Thad Cochran. Thompson served as a volunteer leader with a number of philanthropic and civic organizations in Ohio, including KIPP Columbus, a public charter school; Rev1 Ventures, a technology-based business incubator; and Our Ohio Renewal, a nonprofit addressing social challenges. He was the founding board chair of The Thompson Institute, a campus ministry serving faculty integrating their faith with their profession. For additional details on the inauguration of Dr. Blake Thompson, visit mc.edu/inauguration.